An economic collapse, an EMP, war — these worst case scenarios are part of the reason we all prep, so that we can handle the unexpected. But suppose you have a few hours notice? What are the 10 last minute things that are most important? 1. Contact your friends and family and let them know what is happening. Get the kids out of school, get home from work, in other words get your group together in one location. 2. If you are bugging out to a stocked retreat, load the car, fuel up, gather extra gas cans, and leave now. You can complete the rest of this list en route and when you arrive. Before you leave, make sure you have a destination. You do not want to become a refugee. 3. Make a last minute trip to the grocery store. Buy items that you are short of, but at the very least, grab useful items like batteries, candles, matches and all the canned meats you can carry. Grab any other other last minute supplies you need. Don’t forget extra fuel. Be sure to store it in proper containers for safety. 4. Check your prescriptions and go to the pharmacy and get any refills you can. While there, stock up on the over-the-counter medications your family typically needs. 5. Check your water supplies. Are all containers filled and in good condition? If you have a waterBOB, fill it now,and have 2 on hand if you have 2 bathtubs. If you don’t have a waterBOB, fill your bathtub and all extra containers that you have on hand. Locate your water filters and make sure they are ready to use. 6. If it appears the power will go out, get your generators or other sources of off-grid power ready. It should be done even if you will be using kerosene lanterns, a propane cooker, or anything else that doesn’t rely on generator power. You may need that generator in the middle of the night, so test it and have it ready to go at a moment’s notice. 7. If you have a freezer full of food, implement your plan to preserve it. If this is going to take some time, wrapping your freezer in blankets can help keep your food frozen for a longer period. If you own a Yeti cooler, as your freezer begins to warm up, keep as much meat as possible in the Yeti. This will buy you at least a couple of days before it must be cooked. 8. If the weather is cold and you will lose heat, get your blankets, sleeping bags and cold weather clothes ready. If it is hot, make sure that your group is dressed appropriately for the weather and has plenty of water to drink and battery-operated fans to help avoid heat-stroke. 9. Make sure that your first aid and medical supplies are easily accessible. This medical kit is especially well-equipped. 10. Implement your security plan. These 10 last minute things can be accomplished in a short period of time if you do a bit of pre-planning. For instance, if you are familiar with the layout of your nearest grocery store and where the important items are, you may be able to gather things up quickly. If you have more than one vehicle and multiple drivers, you’ll be able to simultaneously pick up the kids, get the cars gassed up, run by the grocery store, and be on the road quickly. Be prepared to act fast and without hesitation. If you are wrong and nothing happens, you won’t have lost much and you will have had a good drill. UPDATED on July 27, 2016. Precious Metals can be a Good Investment. This entry was posted in bugging out, security, self defense, Self sufficiency and tagged collapse, economy, EMP, preparedness, TEOTWAWKI. Bookmark the permalink. If you still have your kids in the government ‘school’ you are not ready and you are not serious. Most people can’t afford to home school, or send their kids to a private school- no matter how much they want to. Check out the Homeschool community in your area, and read up on it a bit. With access to a library homeschooling can be a very thrifty option. Government schools are a joke, it’s not judgmental, it’s the truth. Yup, i have been home schooling my children. I have 2 boys that are 11 & 12. People spend a couple hundred dollars on school clothes, shoes and supplies when they could be investing it in work books. We love it cause everything is hands on and theres no distraction. My kids probably learn in a day what public school kids learn in 2 weeks. Sad part is my 17 yr old just graduated from homeschooling and now shes headed to college 2,000 miles away which worries me but its her choice. She wamts to see the world, i was the same way so i guess i have to let her fly. We homeschooled our youngest boy over 20 years ago. Initially, his mom and I were nervous at the prospect but we soon learned it was less difficult than we imagined. We spent four hours per day, four days per week, allowing for vacation time, and working around our normal work schedules. He entered our local community college at 15 and had his associates degree at the same time his contemporaries were getting their high school diplomas. During his schooling he held a steady part-time job, as well as working on our farm, instilling a solid work ethic at an early age and from which he has benefited greatly as an adult. One of his shop projects was a ground up restoration of a classic pickup truck, a lot more impressive than the dust pan and ashtray I made in school. The list of benefits of homeschooling is endless and I would recommend it if it’s at all possible. That list goes far beyond academic achievement, too. Many detractors will claim the kids are not properly socialized but that’s easily remedied by enrolling them in Scouting, FFA, 4H, Little League and other local sports activities, as well as social or hobby groups. Of four children, all successful in their chosen fields, the one we homeschooled had the smoothest transition into adulthood and independent living. I’m only sorry we didn’t homeschool them all. Some of us can’t afford to stay at home though. We are ready but my kids still have to go to school and I have to work. That is what we did. My husband worked 24 on 48 off and I worked nights. The mornings he was at the fire station, I gave my son his assignments and took a 2 hour nap. Went over his work, fixed lunch and then took another 2 hour nap. It wasn’t easy, but we made it work. Homeschooling = freedom. Both parents can work and homeschool at whatever time/days they wish. I homeschool, and I don’t teach my kids at the same time others are in ‘school.’ There is other stuff to do while the sun is shining. Prepping and self-sufficiency is the best schooling they can get. Homeschooling can be free with internet and library access. It’s not as expensive as people think. I began homeschooling while unemployed. I know a single working Mom that homeschools! Our community has a facebook page of resources, so many things to learn and do. I will be 60 next month and I have so many things that need to be done. My family doesn’t share in my idea’s of putting back, so I do it when I can alone. I have a plan in mind but need to write it down. My supplies are very short as far as food is concerned. I am working on them as well. It takes time to be prepared but I do have all of my packs done and the others almost done. I hope to have everything ready when it hits and it will. There may not be time to go to grocery store or pharmacy. You should keep a minimum amount of very necessary things to keep from having to get in that line or risk it being cleaned out before you get there. This is the POINT of prepping. Time spent on water, the freezer, and packing would be better spent if one is prepared with supplies. Stop by a hardware store, preferrably not a big box store. Ace hardware stores have clothes, canning jars, ammo, all sorts of good stuff. If you must go to a grocery store, do it FIRST and without any delay. When the civil defense sirens went off for a hurricane in Hawaii years ago we delayed to get our little one dressed, clean up breakfast and such before going to the market. Thinking we had time. There was next to nothing left and people were beginning to act out of panic. We only wanted to grab some extra things and decided it wasn’t worth the risk , left and drove back home. I try and keep three months of food, bottled water, meds and pet needs and a little cash on hand. I get small bills and save them because if theres a cash shortage most people are going to have big bills and there will be no change. Terry, welcome to the never ending debate that is going on in my head. One year I think that $50’s are OK. Then I decide that $1,000 of $20’s still equal to $1,000 of $50’s but it might be easier to spend the $20’s because small bills will quickly become rare. I know whoever wrote this is trying to be helpful. However, have as much as his list ready asap, before SHTF. I won’t be anywhere near a grocery store, gas station or the pharmacy when it hits the fan! Howard wrote this list for those who are paying close attention to the signs of the times, not those who have been oblivious and rush out to the store at the very last minute. And, whether or not a person feels safe leaving their home depends entirely on where they live. 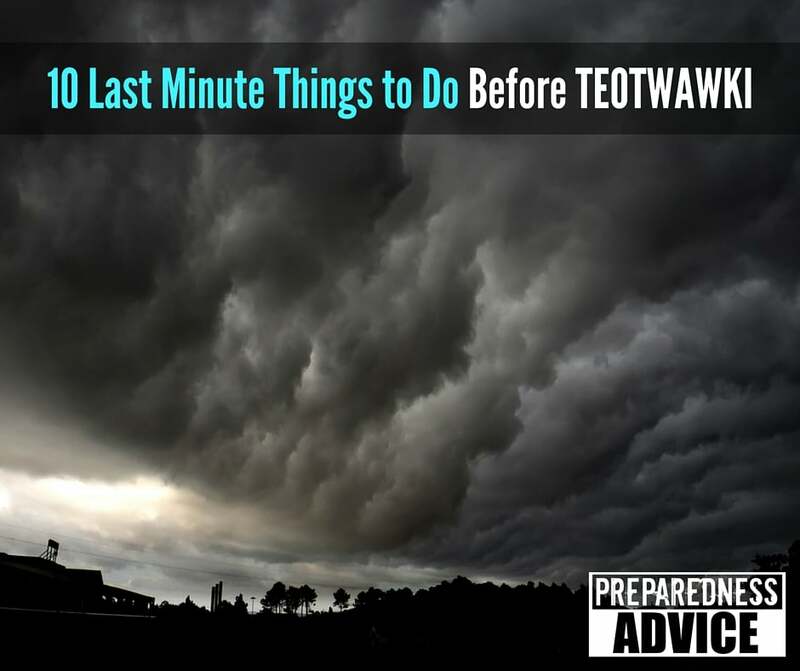 There are many places where I would immediately lock my door and hunker down, but we now live in an area that is small, more in the country, and I’d feel safe making a few last minute adjustments to my preps. Your mileage may vary. DON’T FORGET MATCHES AND BATHROOM TISSUE,LIGHTER KNOTS AND ANY NEWSPAPER,A HAND CAN OPENER,CANDLES.AND .STERILIZER COFFEE AND TEA. I HAVE BEEEN PREPARING FOR A YEAR AND TOLD A LOT OF PEOPLE TO GET READY –OF COURSE THE LAUGHED ND MADE FUN OF ME. Make sure everyone has a good pocket knife, a lighter, a flash light (tactical) or a head lamp, good gloves, bandanas two each, food bars, gum/mints, a supply of water, BRING the first aid kit that has been updated, phone charger, tarps, paracord, at least one change of under clothes, two or more pairs of padded socks, hiking boots, extra shoe/boot lace, a cap or hat, sunglasses and extra seeing glasses if needed, sun protection lotion, toothbrush, floss and money ( small bills) form of ID and pen and small pad to write on. Pocket guide to identify plants, safe and unsafe for humans. I think that trying to go to the store, any store, at the last minute, is undertaking a fool’s errand which will put you in the middle of the unprepared horde in denial. Howard wrote both articles, so it’s not a matter of either/or. You can keep a close eye on events AND make last minute preps. Some things, such as prescription meds, for example, may have to wait until the last minute. Only YOU can decide if it is worth it to shop for extra stuff! It will depend on a lot of if’s. Depending on the crisis, timing, how badly you may need/want more stuff, security, getting family together. YOU need to think this thing through now. As someone earlier said, what will your triggers be? Stay alert, stay alive, stay ahead of the sheeple! That’s exactly right, and every street, neighborhood, town, etc. is going to be different. I once lived in a town of about 4000 people and the community was very cohesive. I also once lived on an island for many years and knew all the shady characters and their neighborhoods. Same general sized area, but in the second, I’d be watching my back every minute. In case food has already been cleaned off the shelves, think about a Feed/seed store. They have dog food (something you need for your pets or can be used for barter). Also 50 lb sacks of cleaned grains such as wheat & corn; these can be ground into cornmeal & flour. Seeds for growing your own food & fertilzer, plus many other useful items. I’m curious about the feed stores. This is ok for human consumption? Well, it’s not poisonous or else the animals would get poisoned. It might be poor quality compared to human grade, but it’s better than nothing. Certainly I’d rather go the other direction and have certified organic food stored, but beggars can’t be choosers. As a child I would often go with my grandfather to feed his horses. When he wasn’t looking I would sneak a handful of the feed to eat it myself. I think it was a mix of oats and molasses. It was very yummy and I never got sick from it.